Pretty even tempos on here, nothing too fast or slow. We'll just keep them in the death metal category. This release is pretty solid you get 10 tracks one of which is a cover ("Terrible Certainty" by KREATOR), which was a good way to end the album. The rhythms on here reflect that of the older releases, namely 'Terror Regime', et al. I have to say it was worth it to wait for a new release like this. It's really solid, the guitars are my favorite part of the album. They're noteworthy, riff-tastic and the combination between them and the vocals will keep them on going for years to come. I especially liked the guest vocals by Schmier (DESTRUCTION, ex-PANZER) on the track "Fearmonger." This is 30+ minutes of brain wrenching death metal. They really stay to their roots on here and don't sacrifice their creativity just to make an album for its own sake. They're really passionate musicians playing in a digital age. It's great that they're making innovative albums. It's a definite plus to hear this one, they're really great musicians. And their death metal is mild, hence it's not entirely too brutal. I felt this one is their strongest release in a while. They're just playing some intense lead guitar as well. But the rhythms hit home with me. I like the gallops and tremolo picking with the guitars, it's quite moving. The production quality is superb and all of the instruments were well mixed into here. Nothing like the guitars don't drown out the vocals, the vocals don't drown out the guitars and the drums are solid. They're still a trio though. They need to find a permanent drummer. There were only 3 members on this release but as I've said there were guest vocals to change it up a bit. These guys play a lot of groove type of metal too. It isn't just death metal, there's that "groove" vibe to it as well.Pretty cool and never letting up on the style(s). They've really caught my eyes and ears to liking this album entirely. Do what I did death metal fans, download the album on Spotify and if you like it enough, buy the physical copy of the album. Get some boom boxes back! A lot of people namely millennials don't even have boom boxes. I know because I've been in contact with someone that I don't think ever had one. 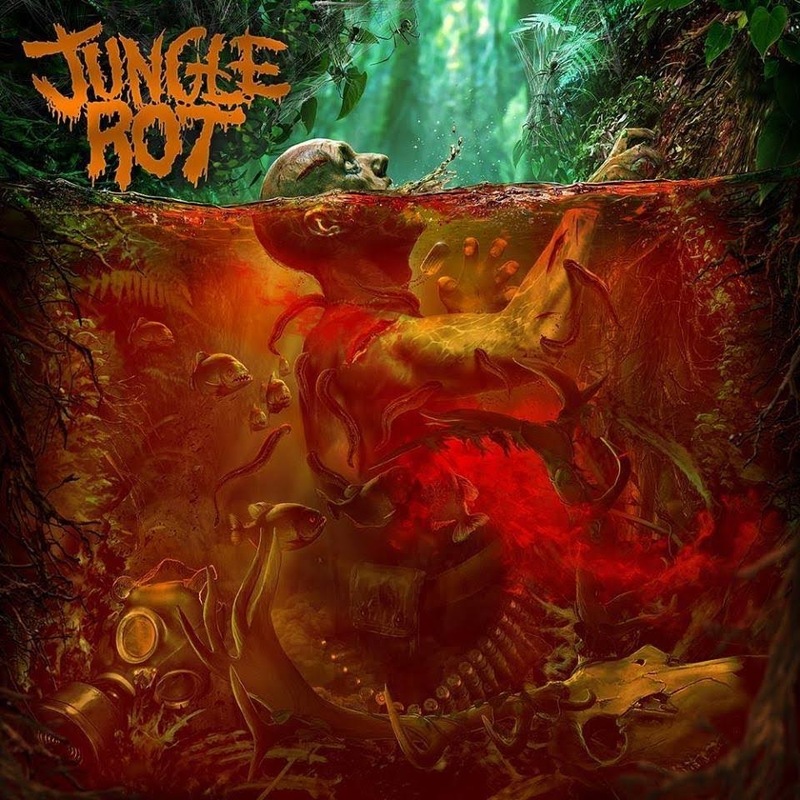 Keep the JUNGLE ROT faith in buying the CD. Show the band that you're going to support them till the end. This self-titled album is so awesome, it'll blow your hair back! It's an album that deserves a "B" rating. Sure it's a little short in length, but it's still really good. OWN IT, NOW! Αναρτήθηκε από Nick Parastatidis στις 7:23 π.μ.